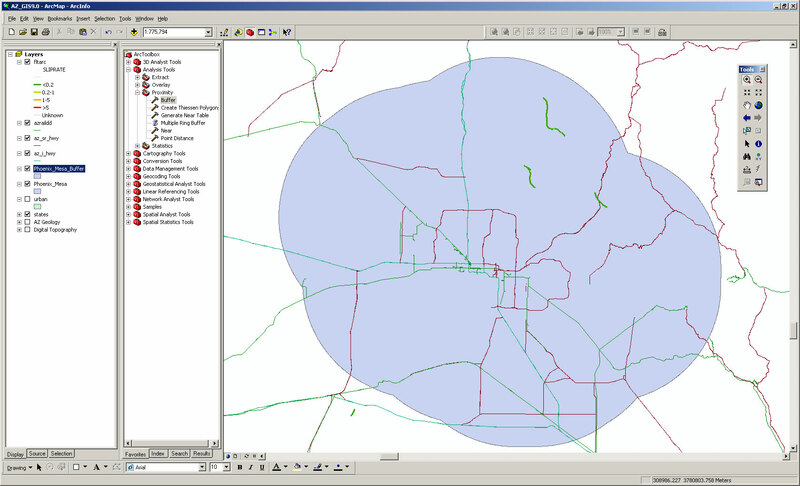 You have now learned the basics of creating and working with both rasters and vectors in ArcMap. In this exercise, we want to give you a chance to work with some vector data to do some queries and other processing to answer an earth science question. In this case, the example will come from Arizona and its earthquake hazards (overall and then for Scottsdale in particular). Arizona digital elevation model and Arizona geologic map (these are in this demo from an earlier lecture: GIS_DEM.zip. Just download it, uncompress it, and open the project file (AZ_GIS9.0.mxd). You can add everything else to it. Arizona municipalities and transportation infrastructure. 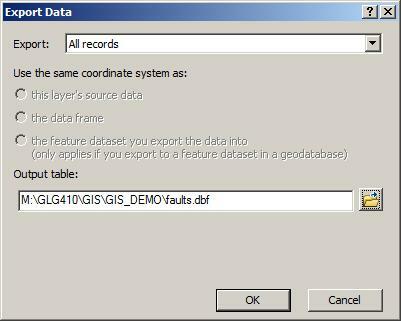 Download these (and lots of other interesting things) here: ASU Libraries GIS services. 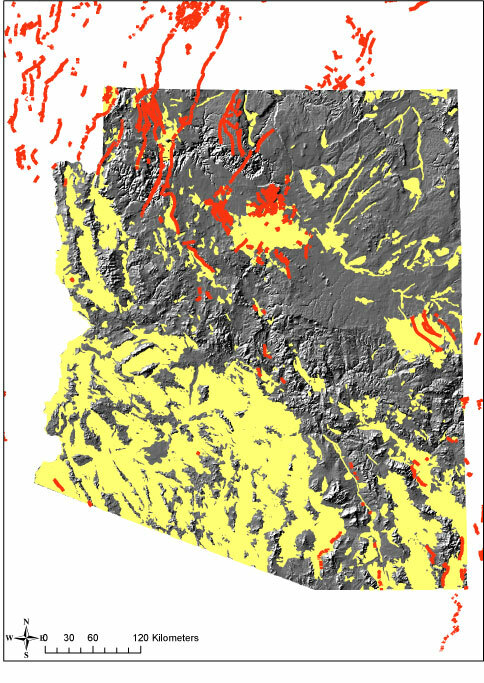 Arizona active faults from the USGS Quaternary faults data base: We have already downloaded, clipped to the Arizona Faults, and projected these data for you. Please use this file: AZQFaults.zip. If you need these data for other projects, go to http://earthquake.usgs.gov/hazards/qfaults/. Look for the shapefile link in the upper middle of the screen. Download the qfaults.zip. For best results, you should project the QuaternaryFaults.shp to the coordinate system of the other files in your project. 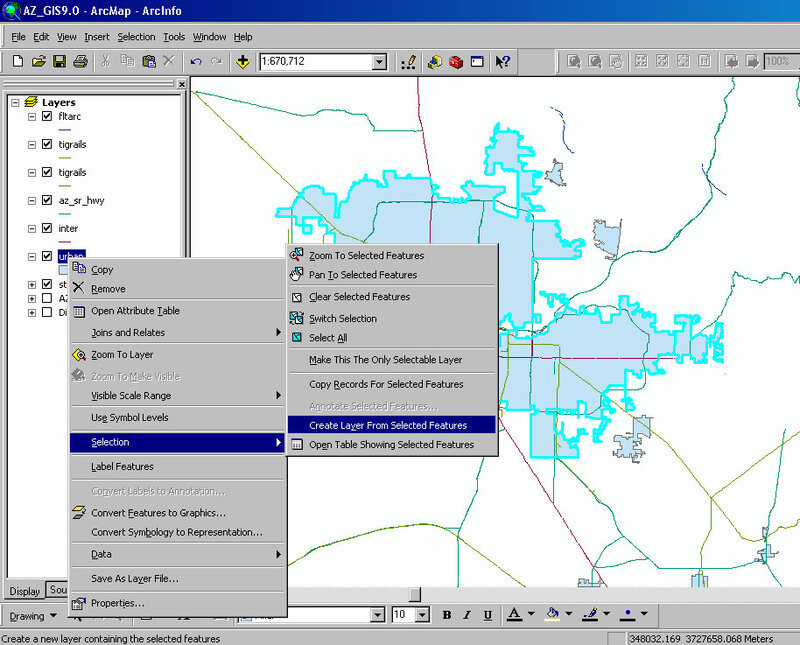 In this example, you are learning how to find certain features in the shapefiles that satisfy a given query. The urban boundaries are in the urban.shp that you downloaded above. Zoom into greater Phoenix and identify with the identify tool. Look also at the attribute table for the urban.shp shapefile. Go to the menu: Selection->Select by attributes. Then choose the urban.shp as your layer to query. Click on "NAME" and then "Get Unique Values"--This just will make it easier for us to know what we are looking for. Double click on "Name" and then click "=" and then look for 'Phoenix--Mesa, AZ'. 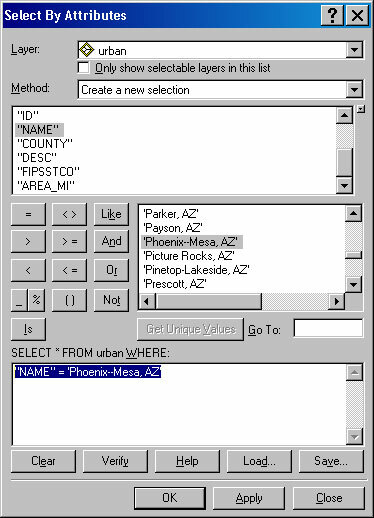 Now we have built the query which will select from urban.shp where "NAME" = 'Phoenix--Mesa, AZ'. Click on Ok.
You will see all of the features that satisfy that query highlighted. Under the layer control, right click on urban.shp: Selection->create layer from features. And yes, you do want to add the exported shapefile as a layer to your current project. The new national earthquake hazard standards say that any active faults within 50 and also 100 km have to be accounted for. A buffer is a zone around a map feature measured in units of distance or time. 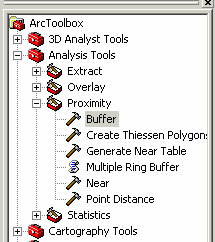 You will compute the buffer from inside of ArcToolbox: Analysis Tools->Proximity->Buffer. Defaults for the output feature class will usually be good unless you do it more than once. Arc may not like to overwrite a pre-exisiting file so just give it a different name. Make sure to chose to Dissolve All so that you will get the composite buffer around the entire selected object(s). A buffer is created at the specified distance. Now that we have the 50 km polygon, you can query the faults shapefile to find all the faults that are inside of it. Which faults are inside the 50 km buffer around greater Phoenix? Menu Selection->Select by location. 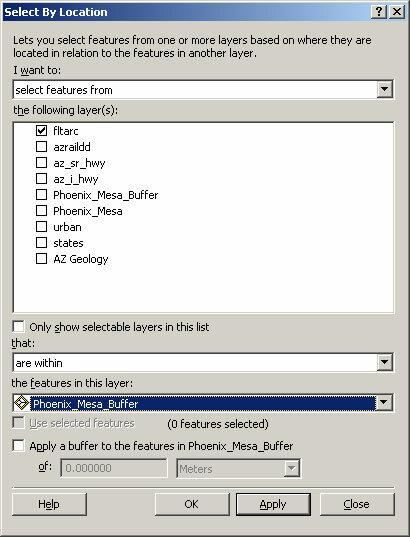 In the resulting dialogue screen, you want to Select features from fltarc.shp (or AZQFaults.shp depending on what you call it) that are contained by the features in this layer: Phoenix_Mesa_Buffer.shp. Push ok. Create a layer from the selected features, and there we have a tabular report of the faults in 50 km of Phoenix and Mesa. You can also make a nice map to go with it (PHXMESAFaults50km.pdf). In this case, we want to find all of the geologic units in Arizona that are Quaternary age and compare them with the active faults. Knowing what you know above, this is pretty easy. It just uses a big query on the Geologic map. 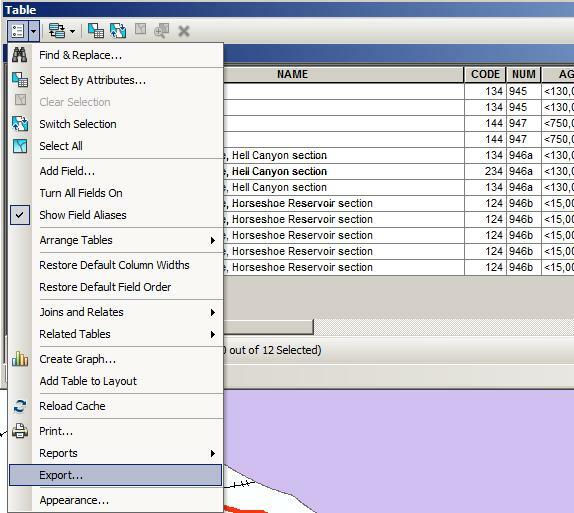 In the menu: Selection->Select by attributes, Select from AZ Geology. Click on Units and "Get Unique Values". 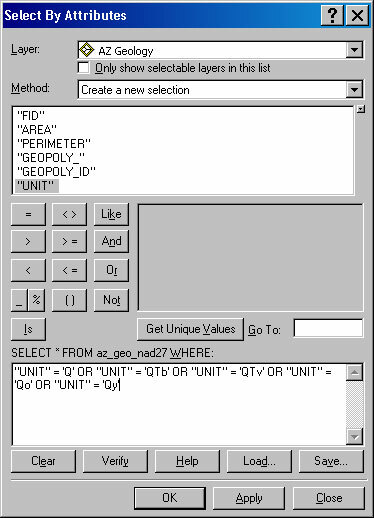 Then sequentially click on "UNIT" = unit of interest OR and repeat until you have everything that has a "Q" in it: "UNIT" = 'Q' OR "UNIT" = 'QTb' OR "UNIT" = 'QTv' OR "UNIT" = 'Qo' OR "UNIT" = 'Qy'. 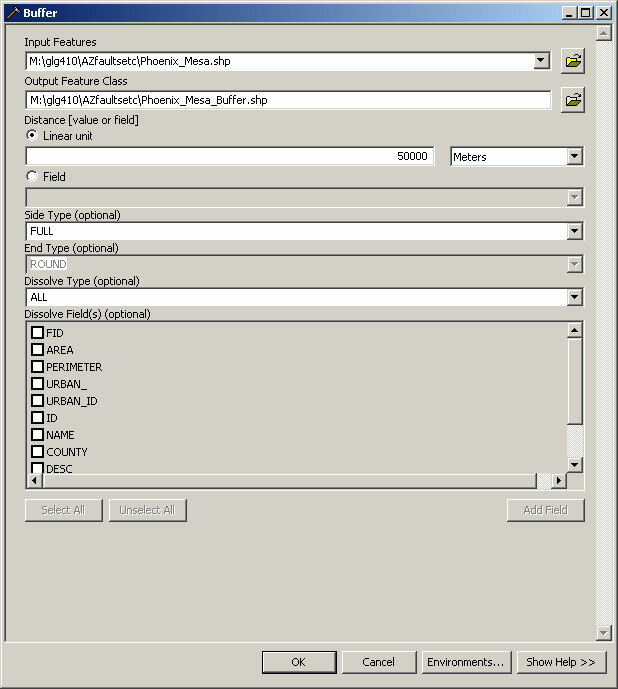 Click ok, perform the query (this may take a little while), and then as above, create a layer from the selected features; export the selection to a new shapefile and add it to the project. Right click the layer from the Table of Contents and select Open Attributes Table. Make sure to export the table as a dBASE Table!